Pizza is big business in the United States, with the industry raking in $36 billion annually according to Food Service Warehouse, a business that sells equipment and supplies to restaurants. While starting a pizzeria to serve America’s favorite food might sound exciting, you'll need to do plenty of planning before selling your first pie. Take the time to do your homework so your pizzeria is successful from day one. Investing in a pizza franchise offers several advantages, including access to an established brand to sell your product. The franchisor provides manuals to guide you in how to make pizza, hire staff and promote the business, eliminating lots of guesswork. However, if you have a proven recipe or interest in creating your own brand, you might consider open your own place under your own name. Start by deciding whether to sell pie by the slice with a few tables and take-out service or a full-blown restaurant with sit-down eating and a bar area. No matter which route you choose, lease a space in a high-traffic area that’s big enough for a kitchen and some large ovens. If you plan to offer pizza to go, create a carryout counter that's separate from the main dining area. Plentiful parking is another prerequisite, especially if you plan to provide eat-in dining. Become familiar with your state, city and county business license requirements, zoning regulations and health department inspection laws that require a thorough inspection of your restaurant before you open. Make sure to buy equipment that suits your business plan. For instance, if you want that wood-burned flavor, you'll need a wood-burning oven. Look for a used stove to save money. Decide what other foods you plan to serve, such as calzones and sandwiches, as they may require toaster or conveyor ovens. You also need cutting tables, shelving and refrigerators to hold supplies. Invest in measuring cups and scales to consistently weigh toppings. That way you’re not guessing and putting too much on your pies, one of the fastest ways to lose money in the pizza business. You also need a computerized ordering system to make it easy for order takers to get customer orders right the first time. Establish a relationship with your food supplier to get the best deals on key items like cheese and flour. According to Food Service Warehouse, these two items are used most in making pizzas and the prices fluctuate. As soon as you figure out what you'll use on a weekly basis, lock in a deal to keep your costs consistent. As you prepare to open, send flyers and menus to area residences and businesses announcing your grand opening, complete with free samples and special deals like a buy-one-get-one-free pizza. 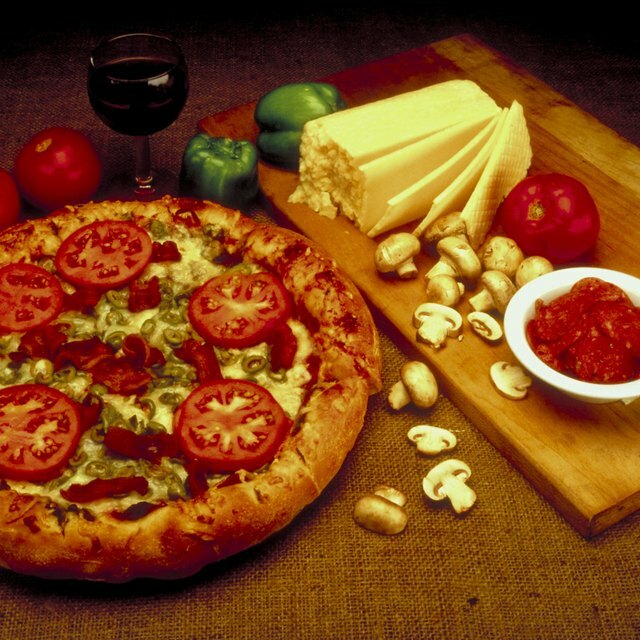 Encourage happy diners to post reviews and photos of their pizza on online restaurant sites to help build credibility. Gather email addresses of each person who enters your pizzeria, and occasionally send special offers via email with coupons for dollars off their next pizza or free extra toppings. Consider building your own website featuring reviews, photos, menus and an ordering service to strengthen your brand. Add printable coupons for free toppings and special prices for pizzas on slow days.